Resources > Job Hunters > Guide to the Perfect Resume > How to write a career objective in a resume? How to write a career objective in a resume? 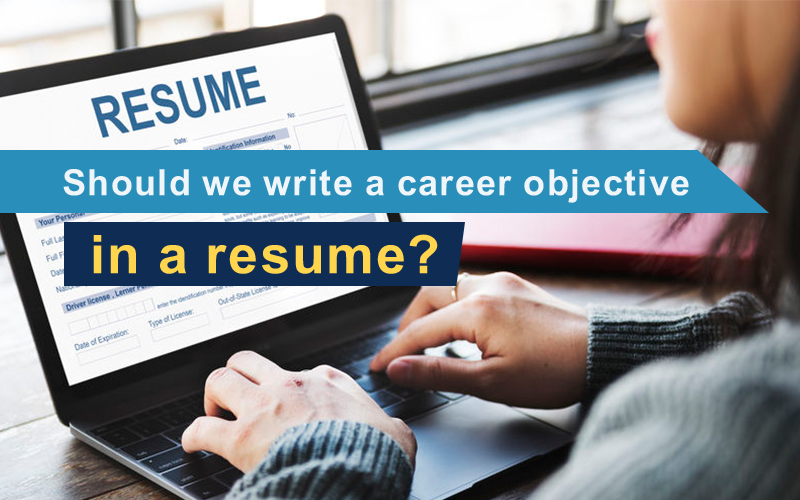 A career objective, also called resume objective, is an introductory statement of your professional goals, ideally written in one to two sentences at the top of your resume. It contains information about why you are seeking employment, your career goals, desired job title, and shows where you have been and where you desire to be in your career. It can also include your most relevant key achievement and what you hope to achieve in the future for the hiring company. A well-written resume objective is your opportunity to convince the hiring manager that your skills and talent align with the position requirements. Career objectives are generally listed after your name and personal details on your resume and before the employment details, education, skills. An effective objective statement, that is tailored to the job description and focuses on your skills and abilities, will enhance your chances to convince the employer that you possess the required skills and know what you want to do. Additionally, including keywords from the job description will be very effective in getting your resume selected by the company’s applicant tracking system. Customizing the resume objective to suit the specific position description will improve your chance to be considered for the prospective role. It will be advantageous to have different and more specific resume objective for every position you apply for in order to add value to your resume that sets it apart from other applicants. Should we write a Career Objective in a resume? Some employers believe that career objectives are not necessary in a resume because traditional resume objective statements simply stated the goals of the job seeker. However, objective statements have evolved in recent years to include other more relevant details. Nevertheless, it is optional but stating a career objective that focuses on your skills and abilities, is a great way to help your resume stand out and convincing employers that you know what you want to do and that you have the skills needed for the job. One of the challenges while crafting a career objective is that you might focus too much on your career expectations, and not enough on how the company will be benefited by hiring you. Therefore, while drafting your resume objective, you must make a strong case for yourself and express why you are an ideal candidate for the job. Briefly add the highlights from your experience including number of years in the industry, key skill set, and any other related qualifications or certifications. Give examples of how you could add value to the hiring company. For example, mention your experience where you significantly increased company’s client base using your interpersonal skills, and state that you wish to apply these skills in the new role you are applying for. A career objective can be very useful if you want to emphasize that you are ambitious and to show willingness and aptitude for the position in order to draw the employer’s attention towards your transferable skills, often in the absence of adequate relevant experience. As a college student or recent graduate, you may be looking either for an internship or entry-level position. In this case, a career objective is an important section of your resume to get the immediate attention from recruiters and to help them understand how your career plans align with the listed job. It should be short and concise and should emphasize what skills, knowledge, and abilities you have, that will help the company achieve its goals. Mention your degree and years of work experience (if you have any); Describe one or two of your strongest personality traits such as conscientious, energetic, creative etc. ; Emphasize your abilities that will help in achieving company goals. Internship experience is extremely valuable for a fresh graduate and should be included in the first sentence of the Resume Objective. If you have no work experience, describe your achievements and activities as a high school or college student. As a job seeker from a different industry, an objective statement will clarify your goals, highlight transferable skills and explain why you are making the change. Connect the dots for hiring managers and explain how your previous work experience has provided you with the skills required in the new sector for a particular job listing. If you intend to move to a new city, your current address may create a confusion for the recruiter. Clarify your plans in the objective statement to avoid any misunderstanding for being in a different location. In conclusion, your career objective is an introduction and may be the first step for the potential employer to know about you, so you need to ensure that it is powerful and to-the-point. The tips to write an effective resume objective are to keep it concise, tailor it to the position description, emphasize your transferable skills and key achievements in your prior roles, and mention any important certifications. Additionally, you need to make a strong case for yourself about what sets you apart from other applicants to grab the attention of the recruiters and convince them how you can add value to their organisation. Find all CV Samples Here! Posted in Guide to the Perfect Resume, Job Hunters by jobsDB editor on April 7, 2019 .